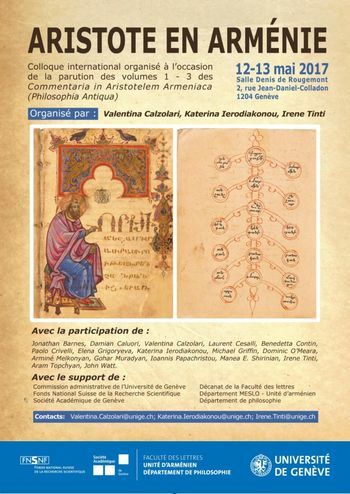 The International Conference “Aristotle in Armenia” took place at the University of Geneva on May 12-13, 2017 (organized by Valentina Calzolari, Katerana Ierodiakonou and Irene Tinti). See the program. Scholars from Matenadaran Manea-Erna Shirinyan, Gohar Muradyan, Aram Topchyan and Armine Melkonyan, as well as specialists of the history of ancient philosophy from Switzerland, Greece, Italy, Great Britain, Germany and Canada took part in the conference. There was also a paper dedicated to Syriac translations of Aristotle's works (by John Watt, Cardiff University). The information about Armenian authors' references to medieval Armenian translations and commentaries on Aristotle’s most important writings and the works attributed to him during the ancient period, as well as to Aristotle’s person, work and apophthegms were novelty for the non-Armenologist historians of philosophy and were accepted with great interest by them. The conference was organized so that the papers of Shirinyan, Muradyan and Topchyan were given in advance to “opponents” (discutant), respectively to Michael Griffin, Ioannis Papachristou and Jonathan Barnes. They had prepared questions and speeches, which ensured a substantial discussion. In addition to the presentations, two published books (David's Armenian and Greek texts with English translation and study) dedicated to the works of David the Invincible and published within the framework of the Joint Research Project between Matenadaran and the University of Geneva (edited by Aram Topchyan and Gohar Muradyan) were presented and discussed during the conference: David the Invincible. Commentary on Aristotle’s Prior Analytics. Old Armenian Text with an English Translation, Introduction and Notes by Aram Topchyan, Brill: Leiden – Boston, 2010 (Philosophia Antiqua: A Series of Studies on Ancient Philosophy, vol. 122. Commentaria in Aristotelem Armeniaca. Davidis Opera curantibus Valentina Calzolari et Jonathan Barnes, vol. 2), and David the Invincible. Commentary on Porphyry’s Isagoge. Old Armenian Text with the Greek Original, an English Translation, Introduction and Notes by Gohar Muradyan, Brill: Leiden-Boston, 2014 (Philosophia Antiqua: A Series of Studies on Ancient Philosophy, vol. 137. Commentaria in Aristotelem Armeniaca. Davidis Opera curantibus Valentina Calzolari et Jonathan Barnes, vol. 3). Next two volumes of this series of works of David the Invincible are being prepared by Manea-E. Shirinyan ("Commentary on Aristotle's Categories") and Valentina Calzolari ("Definitions of Philosophy ").